A slight move away from my usual blog fodder, but one with good reason, and in the same spirit as my normal posts: celebrating food. 6 months ago, I turned 30. I’d recently left a job that I thought when entering it would be a lifelong career; it was a decision that was originally born in trauma, but made over a long period of time. By the time September and my big birthday rolled around, I’d left my job as a barrister, retrained in patisserie, and tentatively dipped my toe in the often very cold water of freelance journalism. It’s a scary thing: lurching between exquisite self-doubt, and manic optimism. I had been shortlisted for the Young British Foodies’ Fresh Voice in Food Writing award for a piece I’d written about Delia’s minestrone soup. The day after my birthday, I attended the awards ceremony, and to no one’s surprise more than mine, I won. 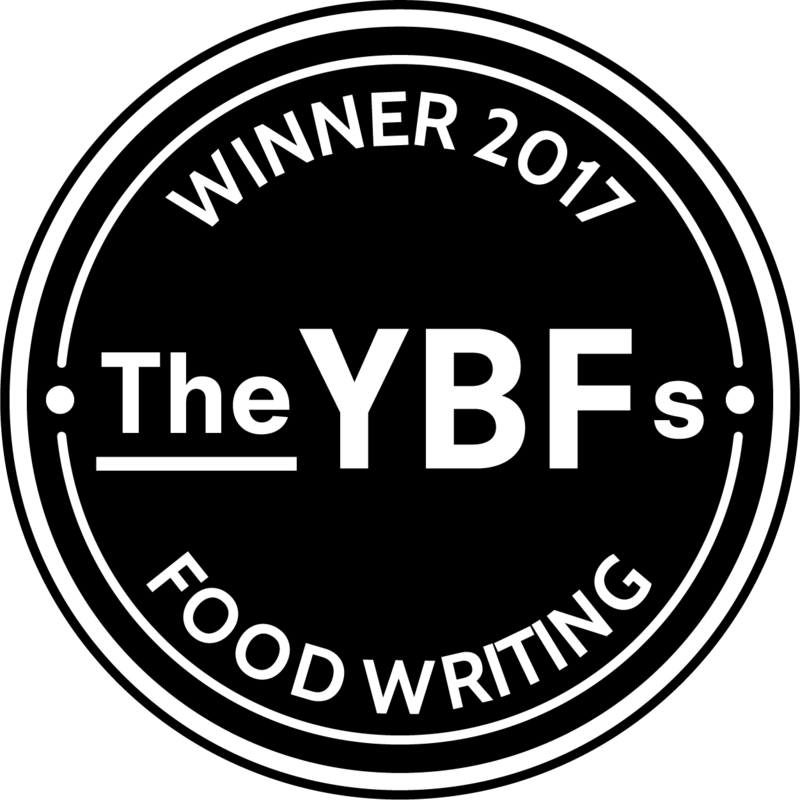 I am immensely proud and honoured to have been awarded the 2017 Food Writing award, even more so for it to be for a piece of writing about my mother, about discovering recipes, about the inheritance – or lack thereof – of recipes, and the role they play in our lives and relationships. The food writing award is unusual in that it asks for a submission of 700 words, rather than one or several articles; there is no need for it to be published, or a paid commission, no date range. There’s something levelling about this, that I really like. You don’t need to be known or prolific to win, you just have to be good. Setting to one side the small possibility of my partisan view of them as the ultimate arbiters of taste and talent, the YBFs is a fantastic initiative, shining the light on emerging talent. More than just a one-off awards ceremony, the YBFs support those who win, nurturing talent, providing ongoing mentorship and – for the producers – the chance to pitch to Harrods. Nominations are now open for the 2018 Young British Foodie awards, seeking to recognise and celebrate the rising stars of the food and drink industry, and their reach is broad: now in its seventh year, the YBFs seek out the best and brightest of British talent in the food industry – chefs, sommeliers, front of house, producers, bakers, and food sharers and writers. This year sees Danny McCubbin judging the brand new category ‘Giving back’, which recognises those who have enriched the community through food and drink. La Grotta Ices) and Terri Mercieca (of Happy Endings), the winners of last year’s Street Food and Baking categories respectively. Even the butter for the bread (perhaps the most anticipated feature by those in the know?) was provided by a YBF alumnus: Grant Harrington, won last year’s honorary category for his Ampersand butter, an artisan cultured butter made in Oxfordshire. The skill and joy of those contributing glowed through every moment of the night, a testament to the breadth of technique and passion that each of those winners and finalists held. It was an edible reminder of just how much grassroots talent there is in the food and drink industry, and what a fantastic job the YBFs do of finding and showcasing it. So, nominate yourself, nominate those whose work and produce you love. The #YBFS2018 are open for business. Wow, huge congratulations for winning the award. Very well deserved, you really have found your home in cooking and writing. I don’t recall when I started following you but your e-alerts are one of the few that I always click on straight away to see what you’ve been up to. I’m sorry to read that you lost your Mum so young but pleased you’re finding comfort in things that help you retain that connection to her.